Spain's interim head coach Fernando Hierro has stepped down from the role following the team's round of 16 exit at the World Cup 2018. He took charge of the national team just two days before the tournament in Russia began after Julen Lopetegui was sacked due to his decision to take the vacant manager's job at Real Madrid. At the World Cup 2018 Spain, under Hierro, failed to impress. They did qualify for the knockout stages of the competition but conceded a late goal to draw with Portugal and then trailed to Morocco for much of their group game only to scrape a draw with a late goal. Then in their last 16 clash with hosts Russia, Spain dominated possession but failed to carve out many clear-cut chances and went out of the tournament on penalties. A statement on Spain's official website said: "The Royal Spanish Football Federation and Fernando Hierro put an end to their relationship once the participation of Spain in the World Cup in Russia ended. "He declined to return to his previous position as sports director of the RFEF to seek new horizons and undertake new professional challenges." 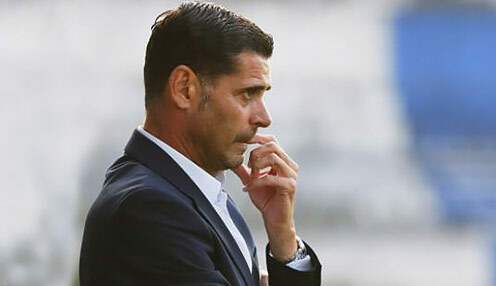 After that defeat Hierro accepted responsibility, saying: "We all tried to give it our best but that's football. Spain, under a new manager, will next take to the field in the new UEFA Nations League where they have been drawn in a group with England and Croatia and they will play them both home and away in September, October and November. Spain are 1212/1 to win the Nations League. Meanwhile, back in Russia, England meet Croatia in Wednesday's semi-final and are 13/10 to win and reach their first final since 1966 while Croatia are 29/10. England are priced at 40/1 to win the tournament.